Good value chalet for three people within walking distance of the Flégère ski lift 700 metres and handy for Chamonix golf course. Located 3.5 km from the centre of Chamonix which has a large range of shops, bars and restaurants as well as a swimming pool and ice rink. 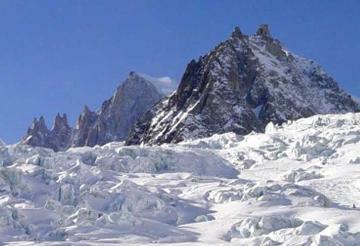 The cable car up to the Aiguille du Midi is a must and ski the Vallée Blanche if you can. Chamonix is a super summer destination too with a marvellous funicular train which takes you up by the glacier. Chalet accommodation covering 35 m² on two floors for 3 people, 1 bedroom, 1 shower room, wifi. The living and dining area is practically furnished and equipped with a wood burner. Fully-equipped open plan kitchen (with oven, microwave, ceramic hob, coffee maker etc.). There is a triple bedroom (1 x 140 cm wide bed and 1 x 90 cm wide bed). Shower room and toilet. There is garden furniture for sitting and eating outdoors. Rail station 3.5 km. Geneva International airport 91 km.